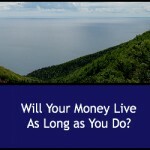 Will your money live as long as you do? King Solomon tells us that a life spent living according to God’s will will be a long and prosperous one: “Hear, O my son, and receive my words, that years of life may be multiplied to thee.” (Proverbs 4:10) But according to a recent Newser article, many Americans don’t realize just how many years that might be – and they haven’t saved enough money to finance all of them. According to Newser, a University of Michigan study spanning more than two decades demonstrated that many Americans severely underestimate the length of their lives. In the study, researchers asked nearly 30,000 people between the ages of 51 and 61 whether they thought they’d still be alive at age 75. One group said they thought so – and a follow-up over two decades later revealed that over 90 percent of them were right. But even among the people who said they didn’t expect to live to be 75, nearly half of them were wrong. The research points up a new trend in human life that’s both encouraging and also disturbing – at least to economists and financial experts. Today, the human lifespan is the longest it’s ever been. At the traditional retirement age, many of us –if not most – can expect to live another third of our adult lives – a period aptly named the “Third Age” by longevity specialists. The question is, how will we finance those extra years? Financial planners already worry that Americans aren’t saving enough for retirement – and that health issues and expenses like assisted living and long-term care could sap public funds as a result. But the reality is, most people in today’s volatile job market can’t simultaneously earn two livings – one for their current life and another for life after retirement. And pensions aren’t as secure as they were for previous generations of retirees, who could expect relatively generous support after a full career on the job. Many retirees look to Social Security to take care of their retirement needs. But Social Security was designed to provide a safety net, not a full living income. And some worry that even that resource might one day run dry. That leaves today’s retirees facing those unexpected extra years with little preparation and resources. Savings can get easily depleted with just one crisis. And other kinds of financial instruments designed to help fund retirement, such as reverse mortgages, trusts and annuities, have their own strings attached and may not work for everyone, especially if there are heirs involved. The solution? An investment strategy that allows for keeping savings intact while providing a regular monthly income. Income property fills the bill. As Jason Hartman says, investing in rental real estate lets you leverage the power of “other people’s money” to fund investments, keeping your own savings available for other needs. Investment property yields a return every month from tenant rental payments. That’s an income that can continue for as long as it’s needed, since real estate is a stable asset always in demand. It can continue to yield returns as long as the investor needs it to. Whit’s more, investing in rental property with a standard fixed rate mortgage that’s paid by tenant rents allows investors to reap the benefits of an array of tax breaks and deductions – as well as home business deductions if they manage the property themselves. In spite of the shakeups in the housing landscape after the disastrous crash of a few years ago, it’s a pretty good time to buy investment property. The housing crash of 2008 sent the lending industry into a tailspin, with allegations of fraud and mishandling of the millions of foreclosures triggered by the bursting of the housing bubble. But mortgage interest rates still remain relatively low and homes are available for sale in viable markets all around the country. Investment property assets can be passed on to heirs. And owners of income property can claim long list of deductions on the most tax-favored asset in the US. Those deductions include depreciation, repairs and maintenance, and even home office expenses. In some cases, a landlord/investor can also claim losses from vacancy periods when there’s no rental revenue being generated.